1The editor would like to thank the authors who have contributed to this book for their professionalism, good humour and patience in responding to seemingly endless queries and requests. We are all indebted to the anonymous peer reviewers for their invaluable comments and to Open Book Publishers for their help and guidance. 2Finally, I would like to express my gratitude to Ewa Balicka-Witakowska, Dmitry Bondarev, Jody Butterworth, Cathy Collins, Tomasz Gromelski, Michael Kellogg, Arietta Papaconstantinou, Mandana Seyfeddinipur, Columba Stewart, Mark Turin and Andrew Wright, who have been most generous with their help. 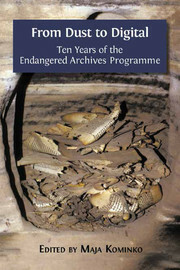 Acknowledgments In : From Dust to Digital : Ten Years of the Endangered Archives Programme [en ligne]. Cambridge : Open Book Publishers, 2015 (généré le 24 avril 2019). Disponible sur Internet : <http://books.openedition.org/obp/2204?nomobile=1>. ISBN : 9782821876262. Kominko, Maja, (dir..) “Acknowledgments”. Cambridge : Open Book Publishers, 2015. (p. IX) Web. <http://books.openedition.org/obp/2204?nomobile=1>.